Beef Bacon is a real treat. Although ‘meatier’ and tougher than pork bacon it has the allure of jerky though in a warm fried kind of way. It is a nice change to conventional bacon and eggs, and makes for a great more substantial BLT. 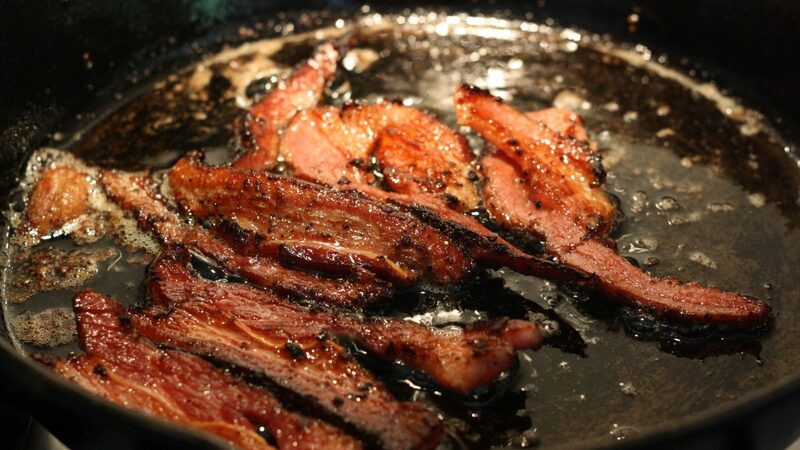 The process to make beef bacon is similar to that of pork bacon, though I tend to use more seasonings to compliment the strong beefy flavour. For the cure I use the basic dry cure described in the excellent book ‘Charcuterie’ by Ruhlman and Polcyn, but add pickling spices. This mix will keep indefinitely, and I use it for my pork bacon as well. I add ¼ cup for each 2kg piece of beef or pork belly. You can make your own, or if you are lazy like me you can use pre-prepared spices. I used a 35g packet of Hoyts pickling spice (yellow mustard seeds, whole peppercorns, dill and allspice) and add a tablespoon of coriander seeds. This is enough for a 2kg piece of beef belly. Grind the spices in a mortar and pestle to release their goodness. 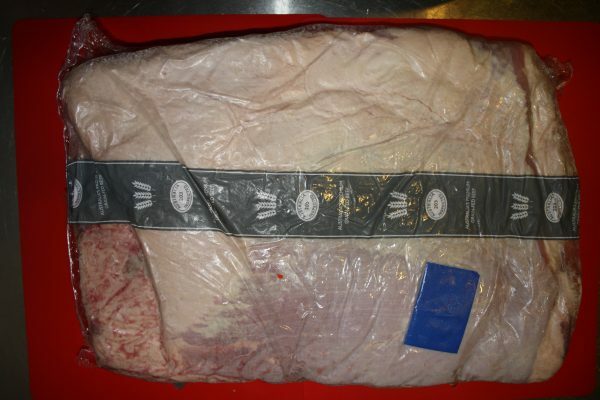 To begin start with a 2-3kg piece of beef belly, also known as beef navel. This can be hard to source, and some recipes use deboned beef short ribs in place of beef belly. Beef short ribs are thicker than beef belly and may require a longer curing time. This stage is not essential, but I feel it adds to the quality of the final product. 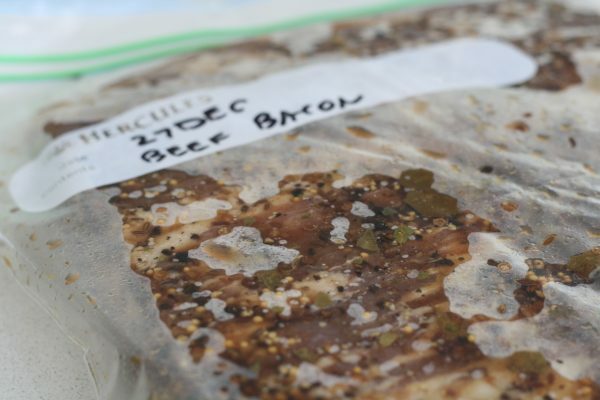 Start by ‘wet ageing’ a piece of beef belly in the fridge for 4-6 weeks (from the pack date) in a cryovac bag. Most larger cuts of meat come in prepackaged bags these days making the process easier. If using beef short ribs leave the bones on at this stage to save having to re-cryovac the meat. After wet ageing the belly, trim off most of the superficial fat to reveal the muscle fibres, then dry brine it in 2kg chunks. A large zip lock bag makes the process less messy as you can throw the 2kg trimmed piece of meat, ¼ cup of dry cure and pickling spices as above into the bag and shake. Express as much air as possible then seal the bag and place it in the fridge for 3-5 days, massaging and turning the bag daily. Place it on a tray in case of leakage. My beef bacon was cooked in a traditional offset smoker. Aim for a typical smoking temperature of around 135C (275F). While the smoker is coming to temperature take the beef belly from the bag and rinse under cold water to remove all the spices, then dry thoroughly with paper towels. Recipes differ greatly at this step, but I have taken inspiration from ‘Let There Be Meat’ by Douglas and Munro. They use maple syrup rubbed over the meat as a binder then season with a brisket rub. You can make your own rub, or use a commercially available rub such as BBQ Mafia’s excellent ‘Steak Out’ rub. Place the meat into the smoker and cook until an internal temperature of 65C (150F) as you would for traditional bacon. Gently smoke the belly with your wood of choice during the process. 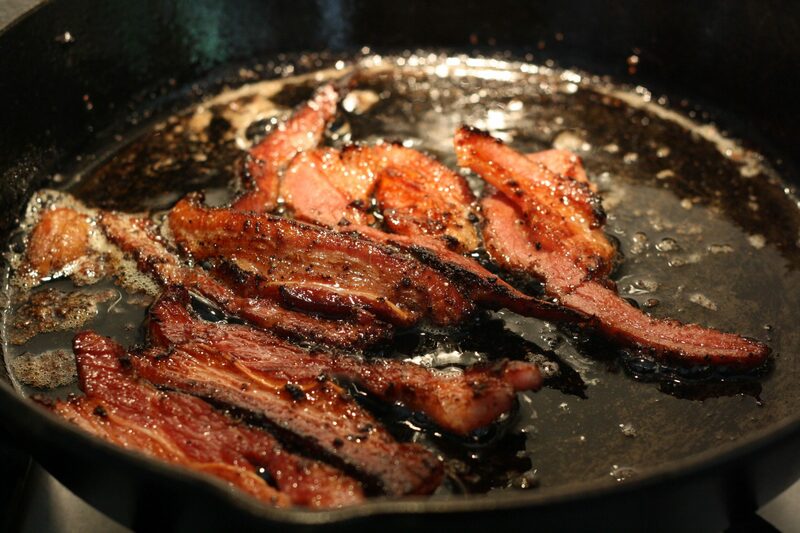 We used a combination of Ironbark and Hickory, as we do for pork bacon. 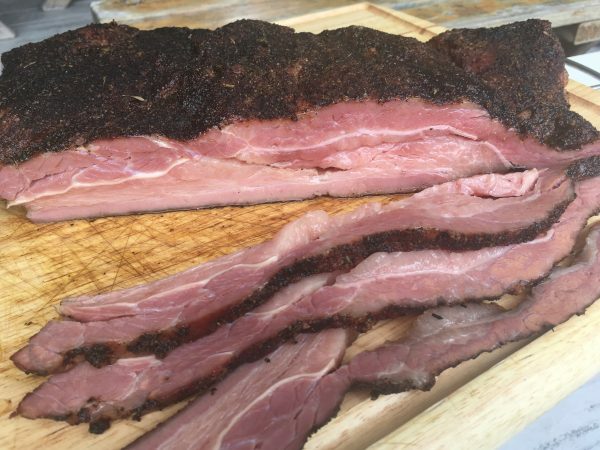 Your beef bacon is now finished and you can slice and fry it up straight away or allow to cool and refrigerate as you would for traditional pork bacon. It is easier slice after it has been in the fridge a little while. Make sure you cut the slices nice and thin otherwise it will be a little tough on the chew. Enjoy!